In a tweet from Tommy Chong on Saturday, he says he's almost finished with chemo and he's winning the battle with cancer. Almost through the chemo/radiation dance and looks like I am winning the fight at least I am enjoying the medication part. Thy Will be Done. Tommy Chong tells LA Weekly that he's being treated for both rectal and prostate cancer. In five weeks, doctors will determine if the cancer has shrunk enough. If not, he'll need to undergo surgery. People keep asking why Tommy Chong and his son, Paris, haven't done their podcast in months. 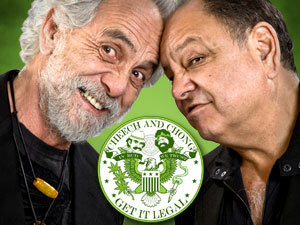 Tommy Chong tells LA Weekly that they're currently making a deal with a server and will be on the air shortly. Comedian/actor/art aficionado, Richard 'Cheech' Marin, turns 69 today. He was born July 13th, 1946 in Los Angeles California.